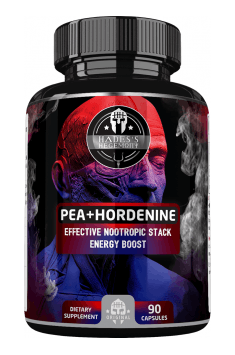 Hades's Hegemony PEA + Hordenine is a dietary supplement containing a synergistic combination of compounds with nootropic and stimulant properties – phenylethylamine hydrochloride (PEA) and hordenine hydrochloride. β-Phenylethylamine (PEA) is a biogenic amine, naturally found in the body and biosynthesized from the phenylalanine amino acid. It is able to cross the blood-brain barrier. Certain amounts of phenylethylamine may be also found in food, especially in chocolate. PEA's properties focus mainly on increasing energy levels and motivation, improving well-being and cognitive functions, and reducing fatigue. Hordenine (N, N-dimethylotyramine) is a phenylethylamine alkaloid, occurring e.g. in barley grains and bitter orange fruits. The effects of hordenine action resemble the action of catecholamines – adrenaline and noradrenaline. The compound has the properties to stimulate, enhance the lipolysis, sharpen the senses, and improve the cognitive functions. PEA acts on TAAR1 and TAAR2 receptors (trace amine-associated receptors), most likely affecting adrenergic and dopaminergic neurotransmission, resulting in increased noradrenaline secretion from nerve cells of the sympathetic nervous system, as well as dopamine and serotonin. Hordenine may stimulate the sympathetic system by increasing noradrenaline release. Hordenine is also selectively metabolized by monoamine oxidase B enzyme (MAO-B), so is phenylethylamine. Thus, the combined intake of phenylethylamine and hordenine allows for the prolongation and intensification of the effects of PEA. By affecting the activity of the sympathetic system, PEA and hordenine cause a significant increase in energy reserves (both physical and mental), increased alertness, productivity and motivation to act. Such a combination will therefore effectively facilitate the performance of an intensive training and undertaking a long-lasting mental activity. PEA, also referred to as the "molecule of love", effectively improves the mood, especially when combined with hordenine. It has been shown that the production of PEA during a physical exercise increases, which contributes to a significant improvement of well-being observed, among others, after a workout, or even to euphoria (the so-called runner’s high). A prolonged deficiency of PEA in the body may lead to depression. The optimal level of this molecule also affects the sense of self-confidence, psychological comfort, and sleep quality. PEA is often (and successfully) used to improve cognitive functions. The research implies the effect of the compound on the increased secretion of acetylcholine – a neurotransmitter playing an important role in memory formation, learning, and concentration. The nootropic activity of PEA is supported by the action of hordenine, which can also independently support cognitive functions and combat the phenomenon of brain fog. Hordenine and PEA support the slimming process. Catecholamines, the release of which is enhanced by the action of these compounds, are responsible for stimulating the lipolysis processes, increasing the metabolic rate, and reducing appetite. All these factors lead to a generation of energy deficits, necessary for effective loss of weight and fat tissue. In conclusion, Hades's Hegemony PEA + Hordenine contains a unique combination of natural substances that effectively help to increase energy levels, improve cognitive functions and facilitate weight loss. The product is recommended especially during an intense physical effort (e.g. before a workout) and mental activity (e.g. during an examination session). PEA + Hordenine 90 caps. In order to facilitate the loss of unnecessary body weight or to increase the energy level during a workout, the best effects will be achieved by taking the preparation about 30-45 minutes before the planned exercise. Due to the stimulant properties of the preparation, other stimulants should be stopped or limited. Although hordenine is relatively selectively metabolized by the MAO-B enzyme (and not MAO-A), the consumption of products rich in tyramine (including cheese, wine) should be limited. In case of taking any medication or suffering from the ailments of the circulatory system, consult your doctor before use. Hordenine may give false positive results in blood drug tests. Hades's Hegemony is a new brand of dietary supplements, which is distinguished on the market by a series of laboratory tests, regarding all its products: SARM MK-677, MK-2866 SARM, SARM GW-501516, SARM LGD-4033 and Yohimbine HCL. The studies were conducted by one of the most reputable laboratories in the USA. Hydroxybutyrate salts enriched in the ingredients promoting effort and mental abilities and adaptogens. Dietary supplement containing L-Theanine powder. Has a calming and anxiolytic effect. Phenylethylamine (PEA) - an organic compound present in the natural form (e.g. in chocolate) and synthesized in the human body from the amino acid and phenylalanine. As a neurotransmitter and neuromodulator affects the nervous system, increases the amount of dopamine and norepinephrine. The only disadventage is too rapid degradation by the enzyme MAO-B in the case of oral administration, thus sometimes modified components retarding disintegration. In the sports supplementation PEA used to improve mood, stimulate, increase thermogenesis, pre-workout. It is also a component in fat burners. Overuse and high frequency of taking PEA may reduce mental form. Dosage: 250-500 mg per day.